Nothing but the best...for Heaven in Harlem. 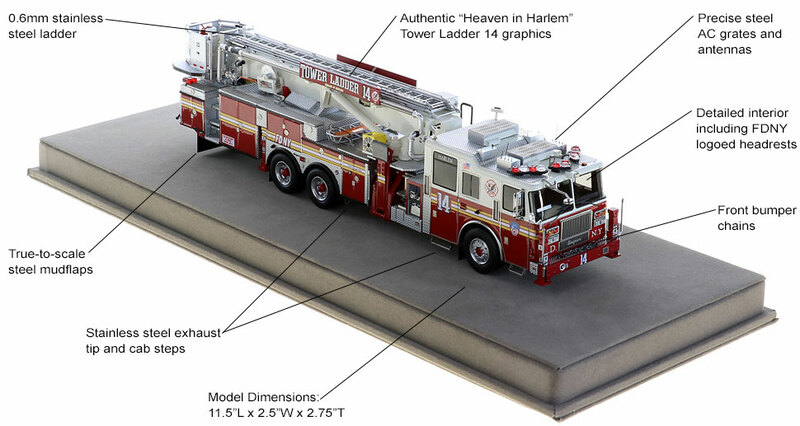 From the front bumper chains, stokes basket and water cooler to the authentic Harlem graphics, this 1:50 scale replica emulates Tower Ladder 14. Our goal with each release is that our customers may notice something new each time they view the model. Tower Ladder 14 features impeccable detailing and true-to-scale parts that only stainless steel can provide. Fire Replicas has ushered in a new standard in 1:50 scale modeling that is sure to impress the most discriminating collectors. Only 100 units of Tower Ladder 14 have been produced. Fire Replicas are designed with the elite collector in mind, and manufactured in limited quantities to enhance long-term value. 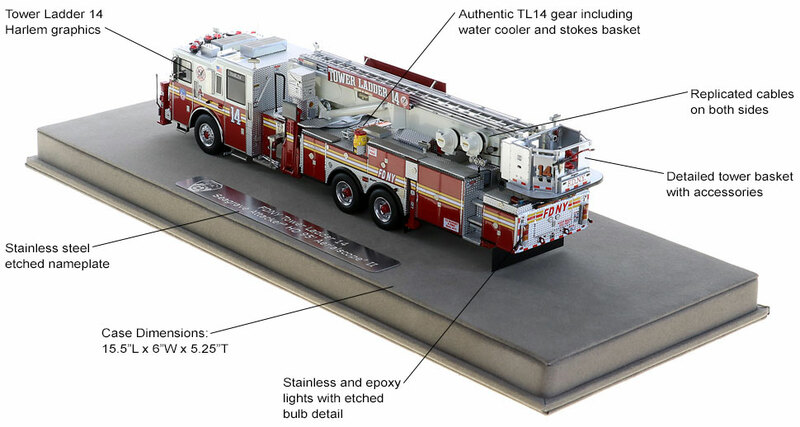 The FDNY TL14 measures 11.5"L x 2.5"W x 3"T and is securely displayed inside a custom case. The case dimensions are 15.25"L x 6"W x 5.25"T and the platform includes an etched stainless steel nameplate with the FDNY seal, department and truck name. This FDNY Tower Ladder 14, a 95' Aerialscope II on an Attacker chassis is a museum grade replica. Like all Fire Replicas models, every detail is modeled to perfection and with razor sharp precision. The replica features the specific department configuration and graphics, leaving no detail overlooked. The display case is custom manufactured with high quality acrylic and resin. The stainless steel etched plate features the department and truck name, and department seal. This replica is a treasure to be displayed and admired and is in no way a toy. This is my first model from Fire Replicas and it is AMAZING! I would definitely get this model or any other from Fire Replicas! Fire Replicas are without a doubt the best of the best diecast models on the market. Not just the Fire Engine diecast market but the entire diecast market. The attention to every detail is incredible and it seems they are getting better and honing their technique with every new model. FDNY Tower Ladder 14 is no exception. I’d like to mention all the fine details they painstakingly recreated on this model but I’d run out of room in this comment box. If you’re a diecast fire engine collector or just a firefighter enthusiast you need to have Fire Replicas diecast in your collection. Another winner here. Very attentive to every detail. Even the smallest things. Just keep getting better with every release. Do yourself a favor if you don't own one of these. Get one and see for yourself. You won't be disappointed. Fire Replicas does it again! They continue to set the bar higher and higher, this time with FDNY Ladder 14. From the detail of the chains on the front bumper, to the accessories on the body deck and cab roof which are unique to each company, its all here. I can't wait to see what is coming out next! 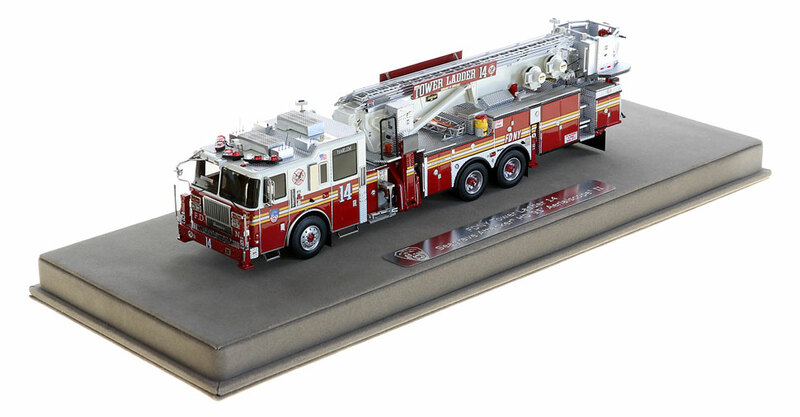 The initial 95’ Seagrave FDNY Towers by Fire Replicas were fantastic and sold-out fast. They are hard-to-find and highly sought after due to the extensive detail and accuracy. Many collectors missed out on them and it is great to see Fire Replicas add another FDNY 95’ Attacker HD Aerialscope II to the line-up. Fire Replicas did not stand pat, and the new TL14 has improvements in detail and quality from the original 95 footers. This is hard to believe given how great the initial trio were. The overall fit and finish are fantastic and the bucket area is especially crisp and clean. The additional details such as the water cooler, stokes basket and bumper chains really make this model stand out. The use of stainless steel components such as AC grating, true-to-scale ladder, and awesome Seagrave grille look great on this model. Not much else to say other than this another winner from Fire Replicas. Only 100 have been produced so don’t miss out.